Preheat oven to 350°F and line an 8x8-inch brownie pan with parchment paper. 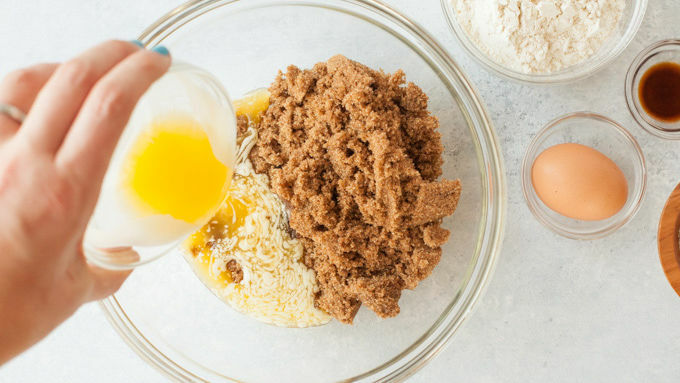 Combine melted butter and brown sugar in a medium-sized mixing bowl. Stir until smooth. Then add in the eggs and vanilla. 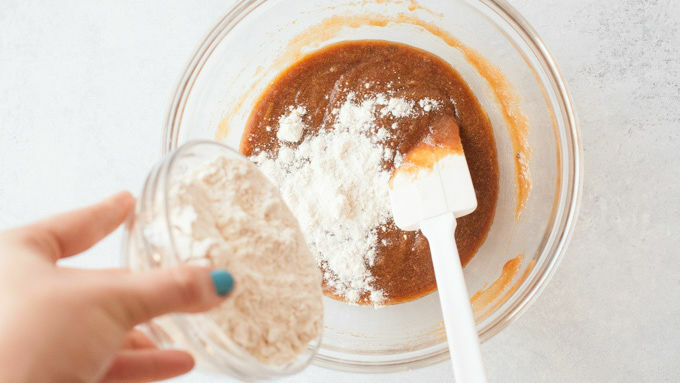 Combine the salt and flour in a small mixing bowl, then add to the brown sugar mixture. 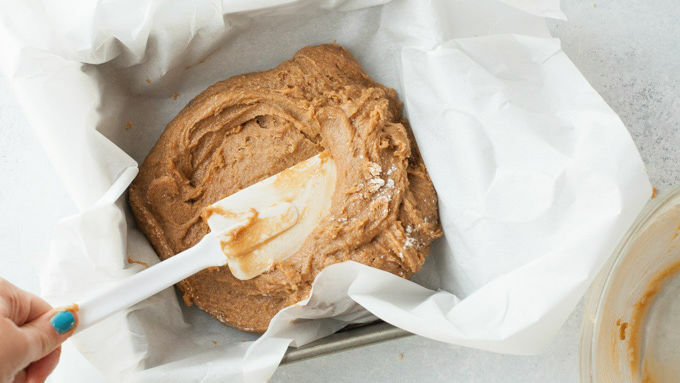 Stir until just combined (overmixing makes for tough blondies—a few small lumps of flour won’t hurt). Spread the blondie batter into an even layer in the bottom of your parchment-lined brownie pan. Set aside. 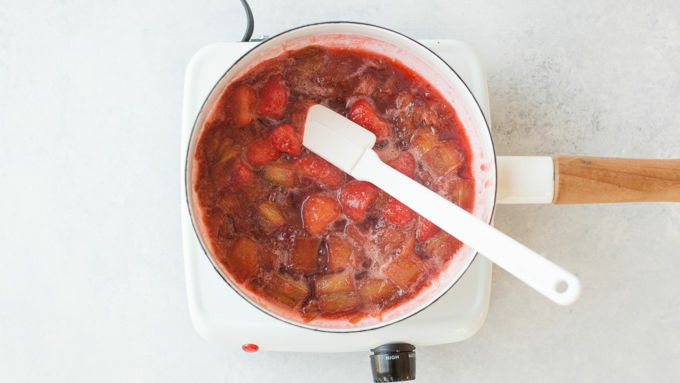 To make the fruit swirl, combine all the swirl ingredients in a small saucepan over medium-high heat. Bring to a boil, reduce heat, and simmer, until the sauce is slightly thickened (you’re basically making a really tiny batch of jam here), about 10 minutes. 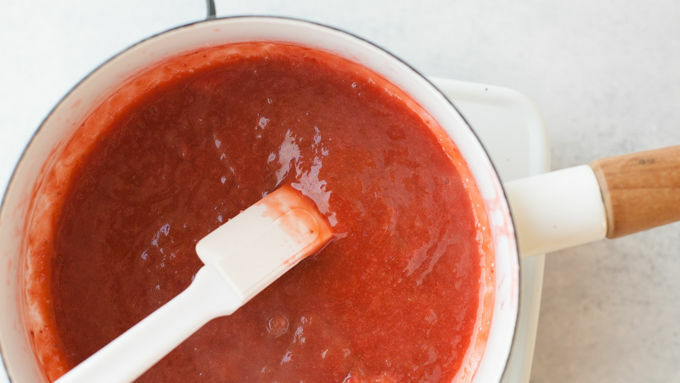 Remove from heat, and puree using a stick blender, or transfer to a regular blender and puree until smooth. Dollop the swirl mixture on top of the blondie batter. Using a butter knife, swirl together. Baked 30-40 minutes or until the middle is still gooey, but mostly set. Lift blondies from pan using parchment paper, and let cool COMPLETELY on baking rack before cutting (seriously, COMPLETELY). Cut into 2-inch squares, and try to just eat one. Store these in an airtight container at room temperature for up to a week (but they probably won’t last that long). I’m the self-proclaimed Queen of the Chocoholics, but even I know that when it comes to dessert bars, blondies are where it’s at! A perfect brownie is amazing, but sometimes hard to create (too cakey, too thin, too crumbly). A perfect blondie? A breeze to make every. single. time. With only six ingredients in the blondie batter, you can’t mess this up. 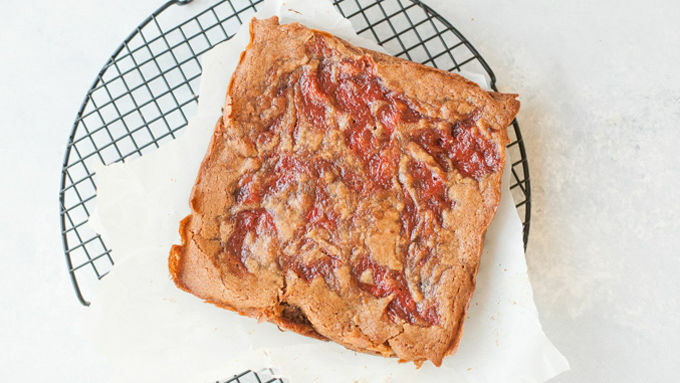 The key to making your blondies rock star awesome? Don’t overcook these babies. No one has ever complained about a dessert being too ooey-gooey (and if they have, they just need to go home), so definitely err on the low side of the cook time range if you can. We’re shooting for cooked through, but still gooey. As they cool, they’ll firm up enough to slice, serve and enjoy—so make sure you wait until they are completely cooled before slicing them. These blondies aren’t for folks who struggle with foods being too rich—they are packed with sugar (hello, 2 cups!) and butter (hello, 2 sticks! ), so make sure to cut them into small squares. I’m recommending the “normal” dessert bar size of two inches (four rows by four rows), but you could easily get away with cutting these rich bars into more rows (five or six in each direction). If you’re planning to serve them at a party or event, you could even do one-inch squares—they’d be the perfect little cubes of deliciousness. For a fun variation, mix in some peanut butter into the blondie batter, and you instantly have PB&J blondies that will blow your flippin’ mind. Blondies for the win. For more of a visual contrast between the fruit swirl and the blondies, swap out the dark brown sugar for light brown sugar. The flavor will be less intense, but still tasty. PB&J variation: Add in 1/3 cup peanut butter to the blondie batter. 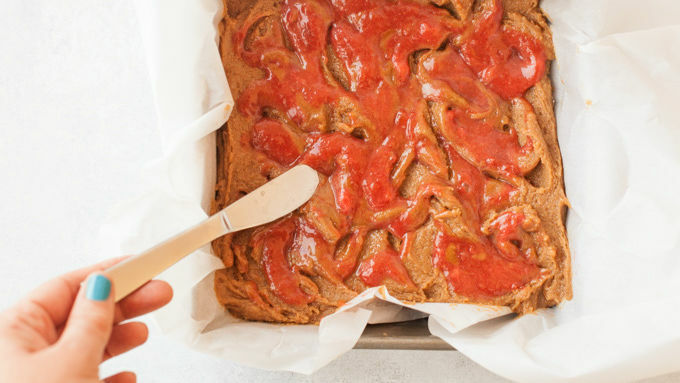 Use fresh strawberries and rhubarb if they are in season, or pick them up from the frozen fruit section of your grocery store for year-round yumminess. Speed hack: skip making the strawberry-rhubarb swirl, and just use whatever jam you have kicking around in your fridge. I’m the self-proclaimed Queen of the Chocoholics, but even I know that when it comes to dessert bars, blondies are where it’s at! A perfect brownie is amazing, but sometimes hard to create (too cakey, too thin, too crumbly). A perfect blondie? A breeze to make every. single. time. With only six ingredients in the blondie batter, you can’t mess this up. 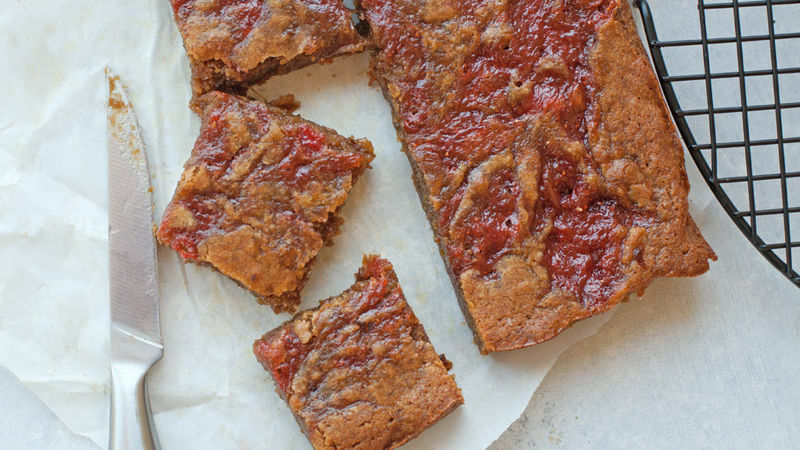 The key to making your blondies rock star awesome? Don’t overcook these babies. No one has ever complained about a dessert being too ooey-gooey (and if they have, they just need to go home), so definitely err on the low side of the cook time range if you can. We’re shooting for cooked through, but still gooey. As they cool, they’ll firm up enough to slice, serve and enjoy—so make sure you wait until they are completely cooled before slicing them. These blondies aren’t for folks who struggle with foods being too rich—they are packed with sugar (hello, 2 cups!) and butter (hello, 2 sticks! ), so make sure to cut them into small squares. I’m recommending the “normal” dessert bar size of two inches (four rows by four rows), but you could easily get away with cutting these rich bars into more rows (five or six in each direction). If you’re planning to serve them at a party or event, you could even do one-inch squares—they’d be the perfect little cubes of deliciousness. For a fun variation, mix in some peanut butter into the blondie batter, and you instantly have PB&J blondies that will blow your flippin’ mind. Blondies for the win.